Warren Elliott served as Chairman of the Franklin County Board of Commissioners from 1996 - 2007. He is also a senior regional representative for a legal publishing company with over 2500 county and municipal clients. In addition, Warren taught State and Local Government at Shippensburg University for five years. He has devoted his professional career to planning and preservation efforts. Under his leadership, Franklin County’s Farmland Preservation Program increased its rank from 23rd in the state to 8th, with over 12,000 acres preserved. The county also prepared and adopted numerous innovative strategies for planning for growth, and for preserving open space. In 2006, he received the “Champion of Farmland Preservation” award from the Franklin County Planning Commission and the Franklin County Farmland Preservation Board. He has also been recognized by the Pennsylvania Association of Environmental Educators for his work, and was awarded the 2002 Farm Bureau Award for his efforts, the 1998 Pennsylvania Commissioner of the Year for Conservation, and the Chambersburg 2000 Partnership Award for his service to planning initiatives in the greater Chambersburg area. Warren was honored in 2004 as a Penn State Mont Alto Centennial Fellow and is also a Distinguished Alumni of Penn State Mont Alto. In 2007, Warren was named “County Commissioner of the Year” by the County Commissioners’ Association of Pennsylvania and was also recognized by Franklin County Area Development Corporation with the “Chairman’s Award” for service to the county. 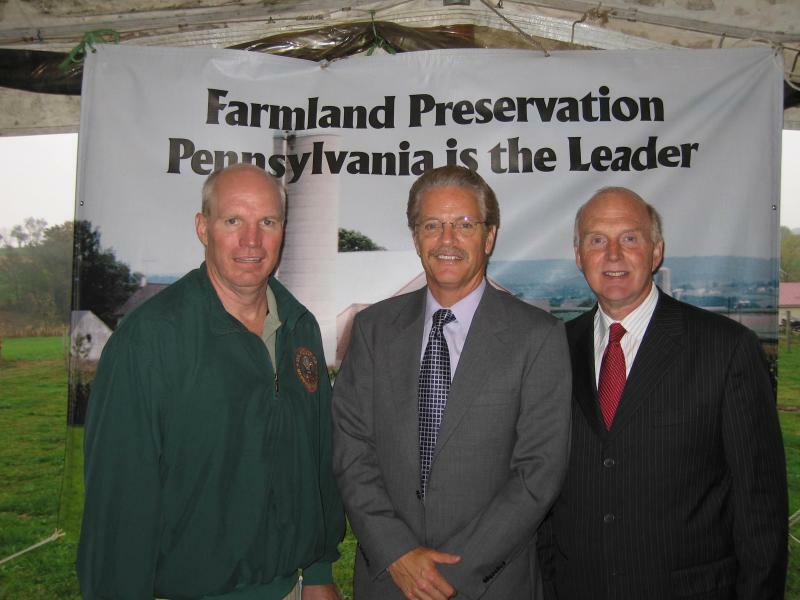 Representatve Tim Holden, Commissioner Elliott, and Pennsylvania Secretary of Agriculture Dennis Wolff.